Is Facial Rejuvenation Acupuncture right for you? In addition to the many health promoting effects throughout the body that acupuncture provides, Facial Rejuvenation Acupuncture aims to correct the signs of aging by both local treatment and by treating the underlying causes of why an individual is specifically manifesting the aging process the way they are. Facial Rejuvenation Acupuncture is painless and non-surgical. Based on the principles of Traditional Chinese Medicine, the treatment involves inserting hair-thin needles into particular areas of the face, ears, hands, stomach, chest, and legs along channels or meridians of energy called “qi”. Specific points are chosen to manipulate the movement of energy in the body according to the individual’s needs. Thousands of years ago the Chinese discovered that many meridians either begin or end on the face while some have internal branches that go to the face. Thus, practitioners of Facial Rejuvenation Acupuncture know how to specifically effect the face while simultaneously treating the underlying factors contributing to the aging process. Though Facial Rejuvenation Acupuncture is sometimes referred to as the acupuncture facelift, it is more than a cosmetic procedure. It is a rejuvenation and revitalization process designed to help the whole body look and feel younger. Anyone who is interested in looking and feeling younger is a good candidate for Facial Rejuvenation Acupuncture. The decision to begin treatment may be professionally or personally inspired or a combination of both. In addition, those who are considering surgical facelift may want to try acupuncture first, avoiding the cost and discomfort or surgery. Facial Rejuvenation Acupuncture is particularly beneficial for those who have already undergone surgical facelift as acupuncture will promote healthier skin and prolong the effects of the surgical facelift. Acupuncture Facial Rejuvenation treats the blood stasis, scarring and potential numbness and pain of surgical facelifts. 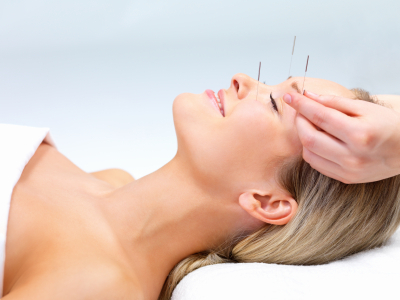 For more information about facial acupuncture, please contact Seattle Acupuncture Center or call 206-319-5322. Eczema is a common skin disease characterized by inflammation, itching, and oozing vesicular lesions that become scaly, crushed or hardened. The condition usually occurs symmetrically on both sides of the body and is recurring. Eczema is an allergic or auto-immune reaction to any one or combination of the internal and external factors affecting the body. There are many different kinds of eczema, some with unknown causes. Traditional Chinese Medicine (TCM) believes that itchy skin is caused by “wind evil.” In TCM, itchiness can move across different places on the body, like the movement of the wind. Inflammation and oozing vesicular lesions are caused by “wet evil.” In TCM, a negative kind of wetness causes effusion from eczema lesions, so we call it wet evil. In this sense, the main causes of eczema are a combination of both wind and wet evil. Acupuncture: Able to treat internal organs or external skin problems, acupuncture adjusts entire organ systems by maintaining balance through acupuncture channels. Upon inserting the needle into the skin, a reaction causes white blood cells and lymph cells to rush around the needled area. This strengthens local skin repairing functions to rapidly induce healing. Acupuncture is used for both its localized effect and for readjusting the entire body balance to repair the organ system to reduce the symptoms of eczema. Cupping: Increases blood circulation, releases toxins by putting pressure on the skin directly, and reduces the swelling and redness that are manifestations of eczema. Diet: Eczema patients should avoid consumption of meat, as animal proteins can cause allergic reactions. Other foods to avoid for this reason include nuts and fried, spicy, and canned foods. Traditional Chinese Medicine believes the above foods belong to “hot” foods and produce “heat evil” and “wet evil,” both of which promote and worsen eczema symptoms. As everybody’s condition is different, each patient will get a recommended individualized diet plan. Depending on the above factors, individual herbal formulas can be prescribed. Patients can choose to drink real herbal tea, herbal pills or herbal powder. While the taste of real herbal tea is not pleasant, it is the most effective treatment. Why all busy women should try acupuncture? First and foremost, prevention. This is the number one reason for trying acupuncture and although it’s not the most common reason to try it. Most people try acupuncture for the first time because they have some kind of ailment such as pain, digestive distress, or emotional imbalance. Acupuncture can and should be looked at as preventative medicine, instead of waiting to get a diagnosis of a specific condition. An acupuncturist is be able to detect much more subtle imbalances in your system and work to correct them. • Acupuncture can be used to offset stress and the effects of aging. Research proves that neglected stress can wreak havoc on our bodies and minds, leading to all kinds of ailments ranging from digestive distress, painful periods, chronic pain, hormonal imbalances, allergies, blood pressure and sugar imbalances, anxiety, depression, insomnia, and fatigue. Cosmetically speaking, wrinkled skin, grey hairs, thin hair, and dark circles under the eyes are no strangers to the extremely stressed body. Acupuncture has been proven to help offset these adverse effects and can help promote a more youthful energetic self. • Acupuncture can help you understand your body and mind better. Acupuncture is not just all about tiny needles. In addition to being treated with acupuncture to help regulate your system, most practitioners offer dietary and lifestyle suggestion that may help you make the changes you want to see in your life. The next time you have trouble sleeping, difficulty concentrating, consider seeing an acupuncturist which might detect subtle imbalances that could be leading to those distressing symptoms. Furthermore, acupuncturists are trained to treat not only the “symptoms” but the “root causes,” which means making changes on deep fundamental levels of your being. Acupuncture facial rejuvenation can enhance not only your physical appearance but also your overall health, giving you a glow that radiates from deep within. It has centuries-old records of it being used in the service of beauty. What’s more, acupuncture’s ability to improve a variety of skin conditions has now been documented in legitimate clinical studies. Acupuncture facial rejuvenation entails no incisions, sutures or acid peels and it will not produce sudden, drastic changes in underlying structures. Remember, it took decades of stress, sun damage and exposure to environmental toxins for your skin to reach a state of crisis, and the damage will not be instantly undone. Acupuncture facial rejuvenation may offer is the reduction or erasure of fine lines and the softening of deeper ones. It is not unusual for patients to report enhanced skin tone, increased energy and eyes that sparkle. Since facial acupuncture is based on time-tested principles of Traditional Chinese Medicine, a person’s overall health may also benefit. Acupuncture facial rejuvenation is, after all, a whole-body treatment. In the Traditional Chinese Medicine view, a person’s face is affected selectively by his or her internal organs. Facial features reflect organic strengths, and as internal organs are fortified, one’s face reflects the improvement. Acupuncture facial rejuvenation involves inserting ultra-fine needles into and around specific wrinkles, acu-points or muscle points, depending on the technique employed. A course of ten treatments is standard, with periodic follow-up visits as needed. These sessions are labor intensive and will be priced differently than customary acupuncture treatments. If you are a smoker or sun-worshipper, you will need to make a longer commitment in order to achieve results. Depending on the technique used, there is a slight chance of minor temporary bruising. If your features are tired and your skin is without luster, yet you do not feel the need for cosmetic surgery, then facial acupuncture may be for you.